With a fresh modern twist on county music Canadian singer/songwriter Chris Gill is set to release his hot new song “Cuz She’s A Girl”. With clever lyrics, encased in music that will surprise twist after twist, this crafty Country cross over song, will have crowds near and far on their feet asking for more. “My songs are pulled from real life experiences, a song of heart break or a toe tapper full of energy and fun, they are all intimate tales of how I feel and about how I see the world around me”, says Chris. Produced by Paul Scholten at County Q Productions in Nashville TN, “Cuz She’s A Girl” tells the tale of the modern women having it all. It is Country rock at its best. Promising to be the hit of summer 2015 “Cuz She’s A Girl” will quickly become an all time favorite. Dropping to radio this week “Cuz She’s A Girl” is available on iTunes April 30, 2015. CLICK HERE to purchase online from iTunes. CLICK HERE to purchase online from CDBaby. "Gone" the highly anticipated new CD from award nominated singer/songwriter Chris Gill is now available for purchase from iTunes and CDBaby. Check out this eclectic musical journey of life & love, "Gone" will embrace the hearts of Country and mainstream listeners until the very last note. 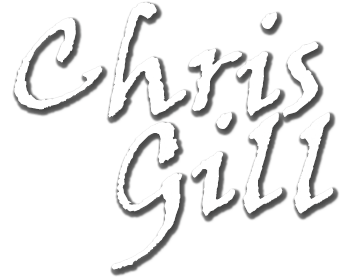 "Gone" is the highly anticipated new CD from award nominated singer/songwriter Chris Gill. This 17 track CD of all original music is a passionate journey of life. From tears, to laughter, to toe tapping fun, the songs of "Gone" are woven together by masterful musicality that is only matched by the feelings from which the lyrics were inspired. The emotions are real, the stories are heart felt, the music brings each and every feeling to life with honesty, while the songs are a true testament to the strength of a battered spirit trying to find it's wings. In this eclectic musical journey of life & love, "Gone" will embrace the hearts of Country and mainstream listeners until the very last note. With over 20 years of experience as a singer/songwriter Chris pulls from his greatest influences to ensure that every lyric, every note displays the truth of a sincerely passionate and devoted artist, who’s heart is born and welded into the honesty of his music & songwriting. As Chris Gill starts talking about his newly released album, his fingers can’t help but run over the keys of his piano. The album was released on September 1 and is already receiving positive feedback while singles such as ‘Life Goes On’ can be heard on local radio. The Valley resident just released his third album – Gone – at the beginning of September and wants any performances to sound just like he does on record. “I didn’t want any enhancers on my album,” said Gill, a Newfoundland native who moved to the Truro area 20 years ago.